(Newser) – If you've braved the world of dating, there's one undeniable fact of which you are likely aware: Single men have terrible pillows. The guy you're dating might have one good pillow (which he insists on using himself) or he might have nothing but bad pillows. Either way, you're going to be forced to rest your head on a "pancake-flat, limp, and visibly stained" excuse for a pillow, writes Serena Golden at MEL. 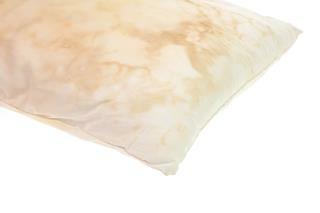 She calls the pillow problem an "epidemic" and says it's time for it to end. And bachelors, don't wait until you have a girlfriend to do something about this problem. If the guy you are dating keeps the best pillow for himself, stop dating him. He's a selfish loser and you deserve better. Kick him to the curb and walk away. Holy crap just wash the damn thing. Another reason why I am single. I'm also guilty of washing my sheets every few months. Being single allows me to be as lazy as I want and that's how I like it.